Make sure to choose the right match to achieve the best level of targeting. 3. Setting Home Page as Landing Page Many advertisers make this common mistake and lose their customers. They set their home page as the landing page for their ads. A website’s home page usually provides general information. When someone clicks on an ad, they come looking to address their specific need. If there is no consistency between the ad and the landing page content, you are sending away more traffic. Solution: The right strategy is to target a relevant landing page in an ad. So if you are promoting a product through an ad, make sure the landing page is designed around the features and benefits of that product. Also make sure to include a call to action within the landing page. 4. Not Tracking AdWords Campaigns Many advertisers either don’t have the time or simply ignore this aspect of their AdWords campaigns. If you don’t know how your campaign is performing, there is no way you can learn about its effectiveness or make improvements. Solution: Link your AdWords account with Google Analytics. Link Google Search Console with your AdWords account and it will generate Paid & Organic Report. Keep track of all the reports and optimize your campaigns based on the campaigns’ performance. 5. Don’t Ignore Your Competition Another common mistake among Google AdWords users is that they simply ignore what their competition is doing. When you know what keywords they are targeting and what landing pages they have developed, you can improve your campaign by leaps and bounds. 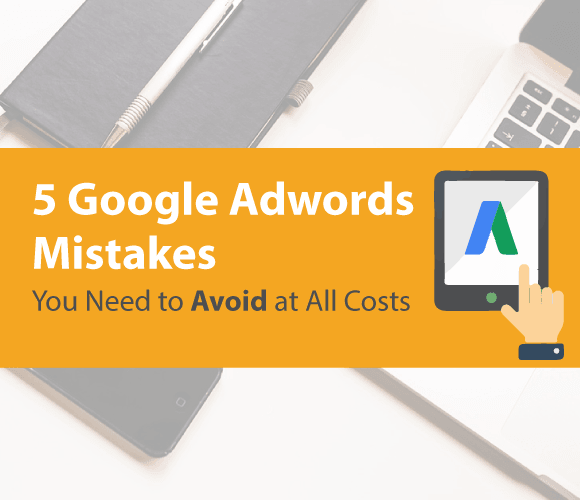 So make sure to avoid these 5 common Google AdWords mistakes. Your goal when running a campaign is to get the best ROI. Make sure to address these issues to get the best returns for your advertising dollar.